So, why the quick about face? Chalk it up to me being sort of a techno-geek. A techno-geek without a lot of resources, i.e. money. But I felt like splurging a bit and let me tell you, I am not disappointed. First, the e-Ink resolution on the latest generation Kindle is much better than its predecessor’s. It is darker, smoother and closer to matching the ink found in traditional books. Second, the device is smaller which increases its portability, a major plus for me. I just didn’t feel comfortable taking the second generation Kindle on the road. Seems like it drew too much (unwanted) attention. I coupled my purchase with the Kindle Lighted Leather Cover giving it the appearance of a day planner and the feel of a traditional book. That sealed the deal for me. I truly feel as if I am reading a novel and not peering into an electronic device. Since it is an electronic device, I should note the navigation is more intuitive. Page turning is faster and the keyboard and navigational buttons are smaller giving the device a less “busy” look. There is the Wi-Fi version – the one I chose – or WiFi + FREE 3G if you are serious reader and want the ability to download whenever and wherever you are. 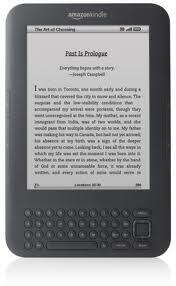 I highly recommend the latest generation Kindle to all book lovers. And, yes, I will still buy traditional books every now and then for old time’s sake but I plan to download more titles as well. If you’re on the fence about purchasing it for yourself or as a gift, quit straddling. If you’re looking for an eReader, that is a device to read and download book titles, then the latest generation Kindle is money well spent.